Each day, most women perform a juggling act. Bouncing between home and work, the pace is never ending. If a woman is a wife and a mom, even more hectic days follow one after the other. Many women are raised to care for others. The last person a women takes care of is herself. That’s why spa gifts are so popular at Christmastime. 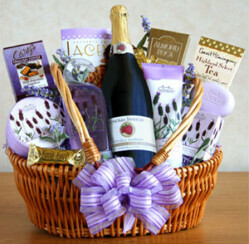 This lavender gift basket has everything a woman could want. Lavender is known for helping to calm and induce sleep and smelling this scent definitely helps a person to stop and smell the flowers. Filled with a mixture of bath and food products, this is an ideal Christmas gift for a friend, family member as well as a business holiday gift for one of your co-workers or clients. Massages are one of the most popular gifts of relaxation to give. Many people believe that massages are a gift of luxury. On the contrary, massage is considered therapeutic and is known to alleviate a multitude of ailments. These include lower back pain, migraines, tight muscles and anxiety and depression. It also increases joint flexibility and enhances immunity by releasing the toxins deep within your muscles. Swedish massage really penetrates deep into the muscles to lessen pain and stress. This spa blanket is a fantastic choice for women who have everything. Soft and comforting, this blanket is scented with a combination of lavender and peppermint. It can be chilled in the refrigerator to help soothe injured muscles or joints, or you can heat it in the microwave to penetrate sore muscles. It really comes in handy when you want to stretch out on the couch after a long day of work or snuggle up after a soak in the tub. Relaxing is an easy thing when we take out to stop and smell the roses. Please share below how you love to relax after a busy day.